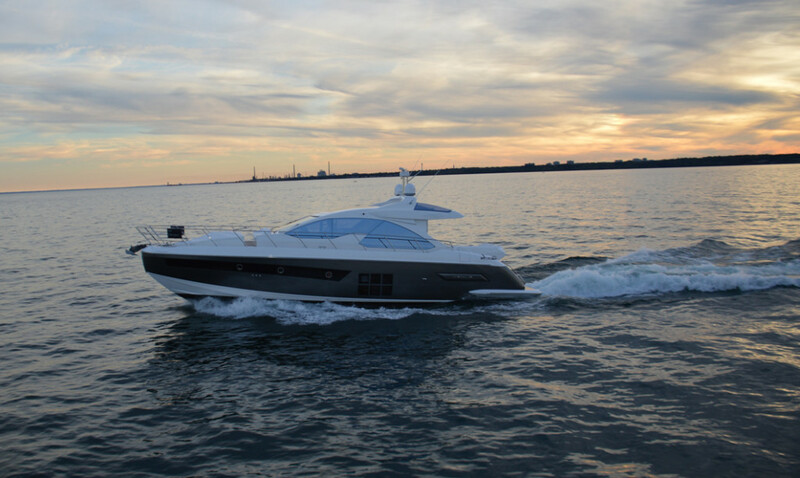 Most North Americans may have never seen an Azimut Yacht in person. The Italian boats are popular in Europe but don’t have a massive market share on this side of the pond just yet, so I jumped at the chance to get on board the 55S. The exterior design is striking and clearly has a modern, European flare. It has sweeping lines, the checkerboard windows mid-ship just above the waterline and the distinctive bow with a flat nose section. The aft cockpit is wide open with U-shaped bench seating around a stunning wood table and an entertainment console with grill, sink and fridge all set on teak flooring. Here too is the aft-piloting station with joystick controls for easier docking. When you’re in position, stainless bollards and walk-through doors on both sides ensure access is never an issue. Underneath is something I was surprised to see on a 55-foot express cruiser: a tender garage. When the garage door is flipped out, it creates a massive, extended swim platform. Another surprise is at the bow, with a small, but useful crew cabin with bed and head that can be used as storage if you’re self-piloting. The glass wall lets the light in while keeping the weather out of the main salon, but the three-pieces slide out of the way and make a fully open main level cockpit, complete with a large glass sunroof that slides open with the push of a button. Light and openness is the theme carried throughout, even down below with massive windows in the full-beam master stateroom, mid-ship and also in the full-beam bow stateroom and the twin-bed guest room on the starboard side. This vessel is fast for something its size and runs smoothly as we raced the sunset to the marina. 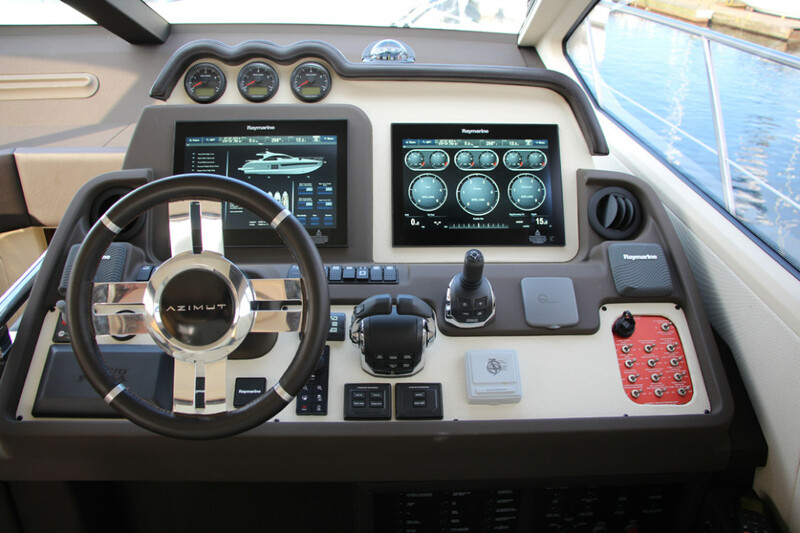 The helm is compact to maximize the living space while remaining fully decked out for big water cruising. Simply put there’s far too much to list on this page alone, you’ll have to check out the video at BoatTest.ca. This boat is also profiled in the Test 2016 issue of Boats&Places.